Dental anxiety and dental fear are major factors causing much troubles for the people attending to their own personal health. Statistics show that the 25-26-year-olds experience higher dental anxiety than others. This can be accounted for by the diverse, intense effects of a number of psychological factors in this age range that can cause dental fear and dental anxiety. The aim of the present study was to survey the dental anxiety levels among the students of the Faculty of Dentistry in Plovdiv and determine whether they change throughout the course of study. Material and methods. The self-reported assessment scale developed by N. Corah, the Dental Anxiety Scale (DAS) was used in the study; it was applied in the form of a questionnaire containing data on gender, age, education. A total of 535 students of all years in the Faculty of Dentistry in Plovdiv were recruited in the study; they were interviewed either individually or in groups. Results and discussion. Anxiety-free students were the most numerous group in the sample (369, 63.08%), which were followed by students showing moderate anxiety. The mean DAS score of the whole sample was 7.83±0.12; the mean scores by groups were as follows: 8.37±0.26 for the first year students (n1), 7.34±0.19 for the second, third and fourth year students (n2), 7.82±0.16 for the fifth and sixth year students (n3). Twenty five (4.27%) students experienced high anxiety and 11 students (1.88%) - severe anxiety. Analysis of the mean dental anxiety scores for the three groups showed that fear of dental treatment statistically significantly declined with each successive year of study (P = 0.008). Conclusions: Dental students have a significantly higher level of dental anxiety at the beginning of their training than at its end (P <0.01). Enhancing education and awareness affects favourably dental anxiety. Key words: dental anxiety, dental fear of students, dental anxiety scales. 6. HalonenH, Salo T, Hakko H, Räsänen P. Association of dental anxiety to personality traits in a general population sample of Finish university students. 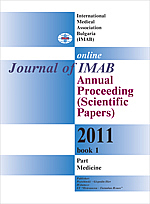 Acta Odontol Scand 2011 Jul 8; [doi:10.3109/00016357.2011.598182 CrossRef] [PubMed].